"In your face, Neil Armstrong." That is one of many hilarious quotes from Matt Damon in the new film The Martian, one of the best sci-fi films of the decade. The film is based on the 2011 novel The Martian by Andy Weir. 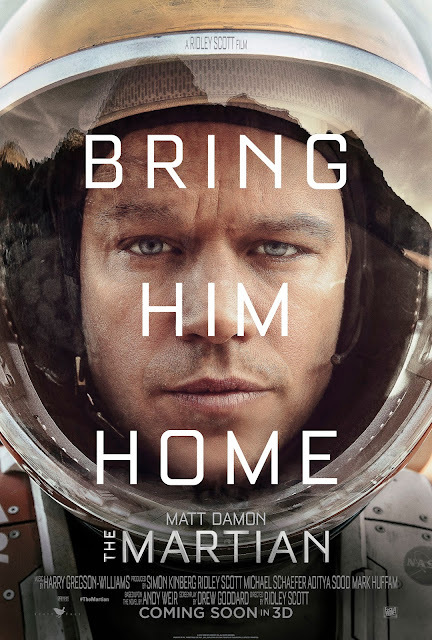 Damon plays Mark Watney, an astronaut in the middle of the Ares III mission on Mars in 2035. On Sol 18 of their 31-sol mission, a severe dust storm threatens the crew, forcing them to abort the mission; however, in the midst of scrambling back to the vessel, Watney is hit by flying debris & lost in the storm. Presumed dead by his crew, Commander Melissa Lewis (played by Jessica Chastain) orders to leave Mars. However, Watney survives; the debris impaled his stomach, but it bonded with his coagulated blood, creating a life-saving temporary seal. After realizing that it will take 4 years for a new manned mission to come back to Mars, & also realizing that he only has food to last 300 sols, he creates a farm using potatoes & his crewmates' feces (using that as fertilizer). Eventually, with the help of a rover, he creates contact with satellite planner Mindy Park (played by Mackenzie Davis) & mission director Vincent Kapoor (played by Chiwetel Ejiofor). They now try to create a supply probe for Watney, & NASA director Teddy Sanders (played by Jeff Daniels) also alerts the Ares III of Watney's survival. After the supply probe fails, & after Watney's farm is destroyed, the Ares III team decides to return to Mars to retrieve him. Matt Damon is excellent, along with Jessica Chastain & Jeff Daniels. The direction from Ridley Scott is amazing, & is definitely his best work. The screenplay from Drew Goddard is also great, & it is really true to the book. The visual effects, film editing, sound editing & mixing, production design & film score are also excellent. While it does falter at some points, it's one of the best sci-fi films in years.